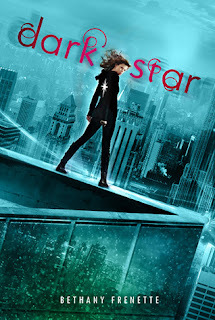 Today I have Bethany Frenette, author of Dark Star, on the blog to talk writing and covers! BF: Superhero’s daughter discovers that demons are real. BF: I was thrilled! I thought it was very pretty, and I absolutely love the coloring. Plus, the vain part of me was really excited to see my name on it. TCR: What has surprised you the most about the writing and publication process for Dark Star? BF: Probably that it’s happened at all. Becoming a published author was my childhood dream – and what I’ve worked for most of my life – so having it actually become a reality was a bit of a shock. A wonderful shock, but still a shock! But in terms of process … I think learning just how much goes into the becoming of a book. I had some idea of the editorial process before selling DARK STAR (we discussed it a bit in my MFA program, and I’d done research on the subject while querying my agent), but I was still rather ignorant of the effort that goes into turning a manuscript into a printed book. So all of that was also very exciting. BF: My website is a good place for it! I’ll be posting all book updates there. And I use Twitter frequently, so that's also an option. 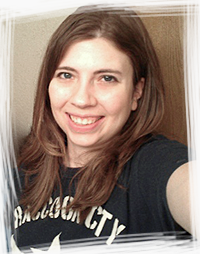 Thanks so much, Bethany! Read more about Dark Star, which comes out on October 23rd, below! "Audrey Whitticomb has nothing to fear. Her mother is the superhero Morning Star, the most deadly crime-fighter in the Twin Cities, so it’s hard for Audrey not to feel safe. That is, until she’s lured into the sweet night air by something human and not human—something with talons and teeth, and a wide, scarlet smile. When an unthinkable betrayal puts Minneapolis in terrible danger, Audrey discovers a wild, untamed power within herself. It may be the key to saving her herself, her family, and her city. Or it may be the force that destroys everything—and everyone—she loves." I think it sounds awesome, I am itching to read it, especially after watching The Dark Knight Rises! What do you all think?